God loves birds and creates trees and forests, men love birds and create boxes !!! Since a few years, Madagascar has become a privileged destination in ecotourism and wildlife. Madagascar, an enchanting island, an authentic country, which will please you for its diversity and for its welcoming people. Madagascar, one of the best destination in the world for Birdwatching tour lovers and for trekking and hiking tour lovers. Madagascar, a destination off the beaten tracks. Through tectonic movement, Madagascar has a long separation from neighboring continents, it split from Africa about 160 million years ago, from Antarctica about 120 million years ago and from India around 90 million years ago ; because of this separation, it contains many endemic species. 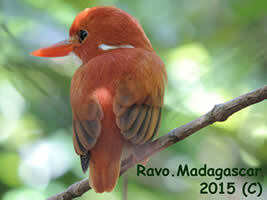 Of the 293 bird species recorded on Madagascar, about 110 are found nowhere else on earth. Quantitatively the bird found in Madagascar is not as rich as those in other countries, but the difference is in its endemicity ( about 110 species ). The most favorable period for observation goes from october to december. 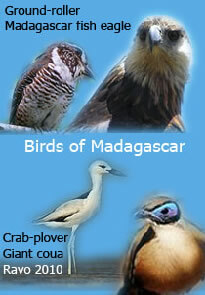 Where are the best sites to observe birds in Madagascar ? 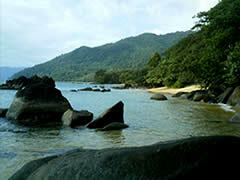 The easiest because of infrastructure facilities are ANDASIBE PERINET - MANTADIA National Parks and RANOMAFANA National Park. The both occur on montane rainforest and on mid-altitude rainforest. You can see there for examples : the Cryptic Warbler, Rufous-headed Ground-roller, Grey-crowned Greenbul, Brown Emutail, etc. It's easy too to find them at IFATY, AMPIJOROA - ANKARAFANTSIKA, ZOMBITSE and ANDOHAHELA National Parks which occur on southern or western deciduous dry forest. Sometimes it's a spiny forest ( characterised by the cactus-like trees and the Didierea trees ). And sometimes, it's a fairly dense seasonally dry forest where it's difficult to penetrate. You can see there for examples : the Thamnornis Warbler, Subdesert Brush-Warbler, Subdesert Mesite, Verreaux's Coua, Running Coua, Lafresnaye's Vanga, Red-shouldered Vanga, Littoral Rock Thrush, etc. Or the Red-capped and Giant Couas, Coquerel's Coua, Sakalava Weaver, Appert's Greenbul, White-breasted Mesite, Sickle-billed Vanga, Van Dam's Vanga, etc. On the way to see these birds above ( at Ankarafantsika National Park ) you can admire for more than half an hour this typical and amazing waterfall ( typical and amazing because of its unique color : a bright red brick ) : the Betsiboka waterfall river on the national road number 4 ( RN 4 ). Tropicbirds are medium-sized seabirds ( 30-35 cm tail-streamers ) found primarily in tropical oceans ; they typically come ashore only to breed. They are predominantly white, with elongated central tail feathers. Red-tailed Tropicbird is an elegant white seabird. When hunting for the flying fish ( and occasional squid ) they feed on, they hover above the water, then plunge dive in after their prey. There are 03 species worldwide, all of which have been recorded in Madagascar. You can see Red-tailed Tropicbird at Nosy Ve islet near Anakao in the South coast of Madagascar ( Tropicbirds are Order of Pelecaniformes and Family of Phaethontidae ). The Drongos are mostly black or dark grey in colour, sometimes with metallic tints. They have long forked tails. They have short legs and sit very upright whilst perched, like a shrike. They flycatch or take prey from the ground. There are 24 species worldwide and only 01 species which occurs in Madagascar, the Crested Drongo that you can find everywhere ( trees, forest, plantations and sparsely wooded terrain ). So Crested Drongo is common, widespread and easily seen at most sites. Endemic to Madagascar. Not globally threatened. 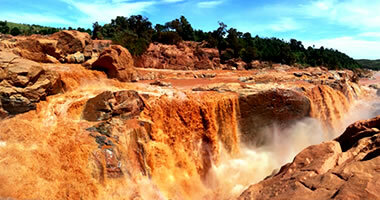 Easiest to see in south and west such as in Ifaty during our tour in september 2013. The Crested Coua is a medium-sized and largely arboreal coua ( size : 40-44 cm ). Family of Anatidae. This family includes ducks and most duck-like waterfowl, such as geese and swans. These are birds that are modified for an aquatic existence with webbed feet, flattened bills and feathers that are excellent at shedding water due to an oily coating. There are 131 species worldwide and 10 species which occur in Madagascar ( Ducks are Order of Anseriformes and Family of Anatidae ). White-faced Whistling Duck occurs in sub-Saharan Africa and Central and South America. In Madagascar, common in the west ( such as Manambolo and Tsiribihina rivers where I go sometimes ). So White-faced Whistling Duck is common in most wetlands in Madagascar and easily seen at Lake Alarobia ( Antananarivo ). 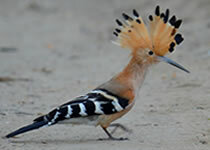 Hoopoes have black, white and orangey-pink colouring with a large erectile crest on their head. There are 2 species worldwide, one of which occurs in Madagascar ( Hoopoes are Order of Coraciiformes and Family of Upupidae ). So Madagascar Hoopoe is endemic to Madagascar. Not globally threatened. Common in the north, west and south of Madagascar. Madagascar Hoopoe is easily to seen in the drier habitats such as in Anjà forest and Ifaty scrub during our birdwatching tour in 2013. You have to organize in advance an adventure trip. 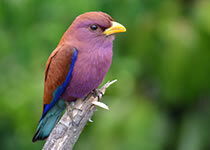 Madagascar, quantitatively the bird found is not as rich as those in other countries ( just arround 285 bird species ). But the difference is in its endemicity ( 110 / 285 ). Come here to observe them with professional birdwatching local guides from October to December. Through 9 very interesting birdwatching sites : Andasibe-Analamazaotra, Mantadia, Ranomafana and Zombitse National Parks (NP), Kirindy forest, Ifaty spiny forest and the southern Madagascar euphorbia scrub on hillsides, then Ampijoroa forest station with Amboromalandy lake. During my tour with Birdwatching people from Holland in October 2018 we've seen with Maurice 50 bird species in just two days-trip at Andasibe NP and at Mantadia NP ; more than 6 bird species of them were very difficult to see. And in September 2013 with Birdwatching people from South Africa we've seen more than 65 bird species ; 37 bird species of them were endemic to Madagascar. we have seen for example THE Cryptic Warbler, Madagascar Brush Warbler, Rand's Warbler & Thamnornis Warbler, Velvet Asity, Crossley's Babbler, Pitta-like Ground-roller & Long-tailed Ground-roller ( in Ifaty ), Subdesert Mesite ( always in Ifaty in 2013 ), Long-billed Greenbul, Appert's Greenbul & Spectacled Greenbul, Pollen's Vanga, Chabert's Vanga, Lafresnaye's Vanga & Sickle-billed Vanga ( in Ifaty for the three last ones ), a lot of Madagascar Magpie-Robin, Nelicourvi Weaver, different Coua species such as Crested Coua, Giant Coua and Running Coua, Madagascar Bush Lark, Common Jery, Green Jery and Stripe-throated Jery, Madagascar Harrier-Hawk, a lot of Souimanga Sunbird, etc. With my experiences since ... 1993, I will give you excellent advice. 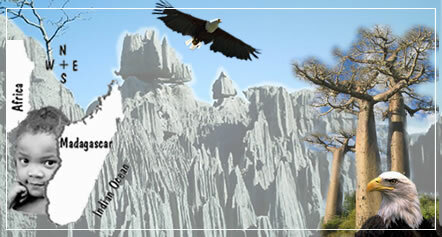 To organise your trip and to guide you to make your trip pleasing and unforgetable. No one who visits the island is left unaffected either by the warmth and hospitality of the Malagasy people and its nature. Because of lack of infrastructures in tourism in Madagascar ( number of rooms, good vehicles, flights, local guides ) it's better to book your trip as soon as possible. D3: Birds at Andasibe NP a.m. then drive to Antsirabe. With nocturnal visit of Kirindy forest for nocturnal lemurs. D5: Birds at Kirindy a.m. then drive back to Antsirabe. D7: Birds at Ranomafana NP a.m. and p.m.
With Birds at Zombitse NP a.m. on the way. D10: Birds at Ifaty spiny forest a.m. and p.m.
D14: Birds at Ampijoroa Forest Station then Birds at Amboromalandy lake. I love my country, Madagascar. I love public relations. I love nature. I love people. I love trips. These passions are what makes me good at my job. Thomas Peters said: « Success at work depends on passion ». I have passionate interest in tourism. And it's a pleasure for me to invite you to visit my wonderful country : Madagascar thank you. Anti-mosquito spray and cream, pocket torch and spare batteries, head torch if possible, swimsuits, light clothes, but also some warm clothes for the highlands, cameras, small good padlocks for your luggage ; your personal medicines such as general antibiotics, anti-diarrhoea, antiseptics, e,g, Betadine, compresses and cotton, ointment for sprains, lip cream or gel ; protect yourself against malaria, e.g. follow a treatment. Sun cream ; sun glasses, walking shoes or closed sports shoes, plastic sandals to walk through streams, binoculars, swiss knife, k-way or windcheater, hat or cap AND cash money = Euros. Most of evergreen rainforests in Madagascar are found on the east coast. This area is a must for naturalist where they can find the greatest diversity of the island's unique flora and fauna, magnificent rugged mountain scenery with rivers flowing down to the Indian Ocean, abundant seafood and fruit. December to March are the wettest months. The east coast is the richest agricultural region of Madagascar, providing high quality produce for export such as tropical vanilla plant, coffee, etc. In the northeast, the Masoala Peninsula is a very rich ecosystem. You can found lying side by side, one of the largest remaining tracts of lowland virgin rainforest plunges almost vertically into the sea to meet a pristine coral reef. 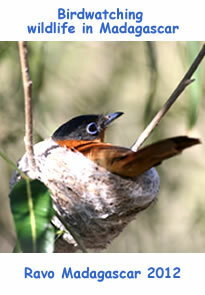 Masoala National Park has a great deal to offer naturalists. But it is the rainiest place in Madagascar. The waters around the peninsula is rich in marine life and the bay is protected from strong winds. The pristine beaches are perfect for swimming and snorkelling ( take your equipment with you ).